As a multi-family real estate broker, advisor and investor, it is imperative to understand all the large development projects in my market and how they will effect real estate owners. Brooklyn Basin has captured my imagination first and foremost because it is directly across the estuary from Alameda’s Encinal Yacht Club where my daughter takes the renowned Jr. Sailing program. And I can tell you the run down industrial waste land that currently sits at Clinton Basin is more than an eyesore, it is a downright visual and environmental hazard. Another reason I love this project is because in the East Bay, where graffiti-adorned store fronts, crime-riddled streets and mattresses on the sidewalks are the word of the day, we really need more upscale amenities and high-end experiences. Brooklyn Basin is sure to deliver thank you Ghielmetti! Signature Development Corp. partnered with a Chinese firm and former Mayor Jerry Brown green lighted the project. I got to meet Mike Ghielmetti and hear him speak recently at the Oakland Structures event and I was impressed with his acumen. Here is an insightful video of Mike explaining his Oakland development project. 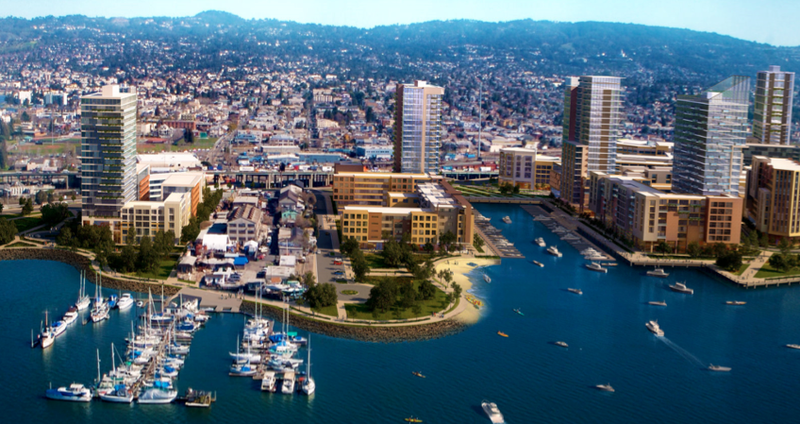 I am extremely excited to watch this vision transform Oakland and the estuary. This entry was posted in Market Conditions and tagged brooklyn basin, jerry brown, Mike Ghielmetti, oakland development, oakland estuary, real estate development. Bookmark the permalink.